She: Are you going for a job interview? I: No, I have a meeting with the film-maker, Shyam Benegal. She: (with a very delighted face) Oh!! Do you act in TV serials? I: No, I am a doctoral candidate. The meeting is a part of my Ph.D. work. She assumed that I was an actor and, definitely, I had some direct connection with the film industry. She was not the only one to think so. In India, the film world is a utopia for common man. Being an outsider, it’s almost impossible to converse with someone from the film industry. 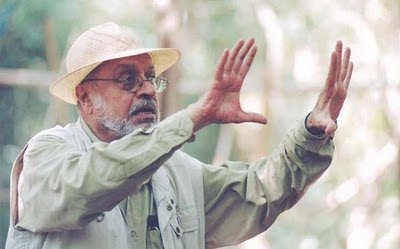 When I uploaded my photo with Shyam Benegal on a social networking site, I got a few calls and comments from friends asking, ‘How was it possible?’ Even my doctoral adviser asked me the same. Hindi films are often seen as ‘escapist fantasies’ and that’s why the directors and actors are imagined to be aliens. I met a number of film-makers in the last few months as part of my research fieldwork. In the very beginning of my fieldwork, things were not very easy. In my research, I have three categories of respondents – audience, film critic, and film maker. Among the three, collecting data from the last category was the toughest one. Because of their busy schedule, they can’t take time out to speak to an unknown person. Last October, I was discussing my work with one of my friends, who is a faculty member in the Centre for Media and Cultural Studies, TISS. During our conversation, he promised to give me the contacts of some film critics. Being a media professional before, the job was not very difficult for him. Within a few days, he gave almost eight contacts of the most prominent film critics, who work for different media houses in India. Through those contacts, in February, I met a very well-known film critic from CNN-IBN. I am really grateful to this film critic as he gave me the contacts of many film makers. Through those contacts, I managed to gather a few more. The snowball method enabled me to get the contact of Shyam Benegal. First, I contacted him in March and did not get a chance to speak to him directly. Someone picked up the phone and informed me that no conversation or meeting would be possible for the next few months. Again, I called him up in May but failed to get any positive response. My husband, a huge fan of Shyam Benegal, kept on insisting that I follow up. Finally, in June, I got an appointment. When he spoke to me over phone in a grave voice, I thought he might be a very serious kind of a person. Usually, I tend to be very tense and nervous before conducting interviews, even though I prepare a lot. But as soon as I reach the office, I always feel very confident. I really don’t know how that happens. I experienced a rush of adrenaline once I reached Mr. Benegal’s office. I reached ten minutes before my scheduled time. I decided to go to his office and settle down. Once I entered his private office, he asked me, ‘What can I do for you, young lady?’ I replied, ‘I am working on the representation of Muslims in Hindi cinema and I would like to have some insights from you’. He seemed very eager to narrate the history of the Hindi film industry and how Urdu language and Hindustani culture played a crucial role in the early period of its development. He said that Hindi, as is often thought, is a not a recent language. Rather, it existed before in a different form. Until the early 19th century, the language was neither Urdu nor Hindi. It was Hindustani which was a combination of Urdu and Broj. At that time, a popular art form was Nautanki and it employed an Urdu-based Hindustani language. Because of its Hindustani origin and its use of Urdu, Nautanki was performed in the urban theatres, which were managed by the entrepreneurs. These entrepreneurs were the producers of that art form. In course of time, the Nautanki became the origin of Hindi cinema. During the interview, he expressed that the wars between India and Pakistan had an impact on the representation of Muslims in Hindi cinema, too. He was frank in his view that there was a homogenization in the way Muslims are represented in Hindi films. To avoid essentializing Muslims, he had to tackle the issue with much care in his own films. He thinks that common denominators are important factors for mass appeal of a film. However, he doesn’t lose faith in the ideology of secularism. He believes that secularism is skin deep among Indians. And that’s why the secular films like Mammo and Sardari Begum did very well.